The Costa Brava ports of Palamós and Roses are expected to receive 60,000 passengers over the 2019 season, an increase of 18% on the previous year. The Minister for Territory and Sustainability, Damià Calvet, announced this new record at the presentation of this year’s season, held today at the Port of Palamós. 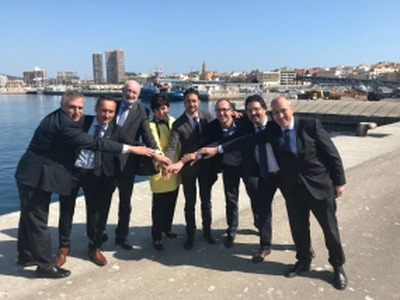 The event was also attended by the mayor of Palamós, Lluís Puig; the mayor of Roses, Montserrat Mindan; the presidents of the chambers of commerce of Palamós and Girona, Xavier Ribera and Domènec Espadalé; the president of Ports de la Generalitat, Isidre Gavín; and the general manager of Ports de la Generalitat, Joan Pere Gómez. This will be the third year running in which there has been an increase in the number of tourists arriving at the two ports. The increase in 2018 was 13%, and in 2017, 7%. A total of 54 stops are expected, the same number as in the previous season. In 2019, 10 cruise lines will visit the two Costa Brava ports. Seventy percent are deluxe lines, and it is envisaged that 87% of tourists will travel with standard-category lines. These robust figures reflect the effort that Costa Brava Cruise Ports has put into promotion. Seventy-seven percent of passengers are from the United Kingdom, 11% from North America, and 3% from Germany. The Port of Palamós is expected to receive 54,000 passengers (up 18%) and 46 stops (the same as in 2018). With this growth, it is anticipated that Palamós will break its record for passenger numbers for the third consecutive year. These figures strengthen the port’s leadership in Costa Brava cruises and bolster its international visibility in this market. The Port of Roses is expected to receive eight cruise stops, the same as last year, and 6,000 passengers, 15% more than in the previous season. As a result, 2019 is expected to be the third consecutive year of passenger growth for Roses.